Blackwood (village) takes its name from Blackwood Estate, owned since the 13th century by the de Vere family (hence the name Vere Road). The mansion house stood at the top of the estate driveway and was demolished in the 1930s. Robert Burns’ sister was married to the estate factor there. The village developed as a result of the railway being built in the second half of the 19th century. Kirkmuirhill is the older of the two villages by far and is first noted in the records in the year 1666. It was latterly closely connected to the local mining industry, but probably developed originally as a staging post on the old Glasgow to Carlisle road, at the cross roads with the road from Lanark to the west. As there was no church in the village prior to 1868, one theory about the origin of the name relates to the upper muir lands of the Kerse, Kerss or Kirse (Kerse House still stands lower down, near the Nethan), through which the old Carlisle road used to pass. The village of Kirkmuirhill stands about half way up the hill (on the old Carlisle Road) that ran towards these lands and a farm called Muirsland still exists at the top of that hill. 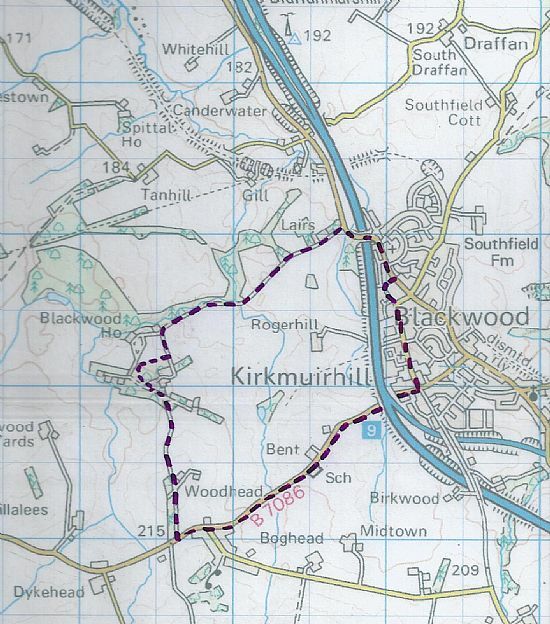 The theory is that the name Kirkmuirhill may have originated from ‘the Kerss (or Kirse) Muir Hill’. In old Scots, a double ‘s’ was written in such a way that it could have been taken as a ‘k’, which would result in Kirk Muir Hill, or Kirkmuirhill (the name Kirkmuirhill is still sometimes spoken as Kirmuirhill). Although the two villages still have their separate names and identities, the border between them has shrunk almost into obscurity. In modern times, Blackwood has increased significantly with the advent of large housing estates, thus further diluting the identity of the original villages. The facilities managed by the Thornton Road Community Centre Association are available for use by people in the whole area, regardless of where they came from originally or which part of the area they live in now.